So, got the pattern, when moms visit us, we handover the kitchen to them… But I thought I would be different. I wanted to ask my mom to rest while I cooked for her . My mom came here on Sunday… I was all excited… As I have decided earlier, I did not make my mom cook … I asked her to relax and play with her grandson. Today morning I woke up and came downstairs to get milk for my son and prepare for breakfast… and what do I see??? Coming to the recipe… This was made by my mom for today’s lunch…. 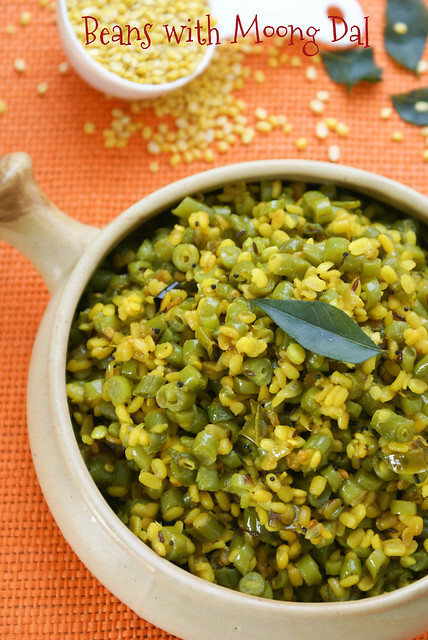 a simple and delicious dish which goes very well with Steamed Rice or Rotis. Soak Moong Dal in enough water for 2 hrs. Strain and keep aside. Boil a cup of water in a medium sized pan, add salt and add chopped beans. Cover and cook till done. Strain the beans, and reserve this water. Heat oil in a wide pan. Add all ingredients under tadka. After the mustard seeds splutter. Add onions, ginger, green chilli and turmeric. 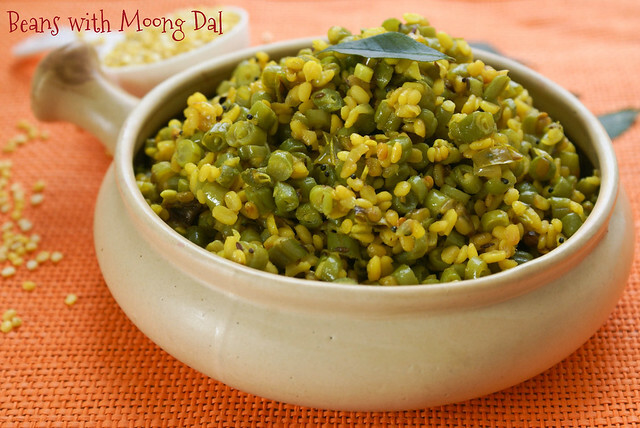 Add moong dal. Fry for a minute. Add 1/2 cup of the water from Step 2. Add salt, cover and cook on low heat for 5 minutes. Till the water disappears. Add Beans and fry for 2 – 3 minutes on medium heat, and then on high heat for 2 min. Do not add strained water in Step 7, more than 1/2 cup, else it becomes mushy. Add a handful of chopped coriander leaves for extra taste. If you are in a hurry, or if you forgot to soak dal before hand. Boil dal along with beans. Strain immediately after done. that looks so yummy, nice combo..i loved ur vessel..
lovely simple curry to have with rasam or sambar rice. Healthy and yummy, mom's make always the best for us. Refreshing and yummy beans and dal. What a colorful and yummy dish.. But also, I love the food pics and recipes, am gonna try few very soon insha'allah.